Lavender has long been a favourite flower. The flowering herb is well known for its perfume and relaxing properties. Our English Lavender design makes a beautiful gift for a birthday, Mother's Day or someone who just loves this beautiful Summer flower. 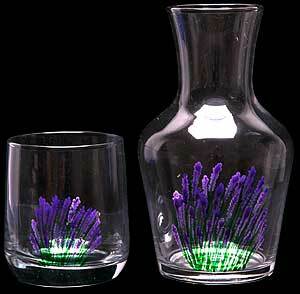 The English Lavender range is a very popular choice with our customers. We have a range of embroidered gift items available in this design, including small gift bags (available with lavender grains), cosmetic bag and jewellery bag. The glassware range includes champagne flutes, goblet, tumbler and water set.